Picture yourself sitting on the deck of the Rifflin'Hitch Lodge in Southern Labrador while eating a meal of Pork Tenderloin and taking in the scenery. A picture of beauty is admiring the wilderness scenery of the Eagle River while eating a delicious Pork Tenderloin Gourmet Meal at the Rifflin'Hitch Lodge in Southern Labrador. This Pork Tenderloin meal has been cooked to perfection with peas and cherry tomatoes accompanying it with a elegant sauce that is hard to resist. 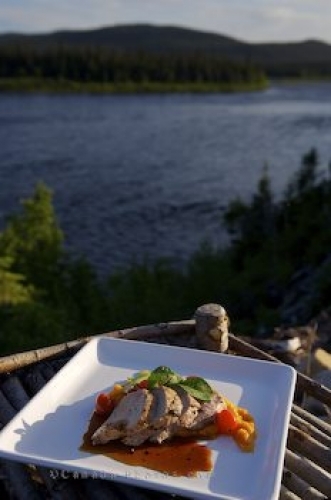 Picture of a Pork Tenderloin meal overlooking the Eagle River in Southern Labrador.